The nineteen-nineties have seen a massive rebirth of the real estate industry in China. Although ownership of Chinese land is in theory restricted to the State and to agricultural collectives, in practice the concept of the `right to use' land has evolved into a system of real estate law with many parallels in the West, including such familiar elements as mortgages, leases, zoning, liens and taxation. 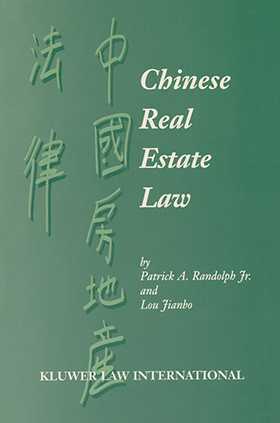 The difference lies in procedural requirements, and it is in this practical area that prospective foreign investors in Chinese real estate will most appreciate this informative and very useful book. landlord/tenant rights and duties in commercial leasing. They provide clear guidance through the complex web of administration and regulation at every government level, including the important role of the agricultural collectives in the expanding urban fringes. They analyze the areas of unsettled law--for example, tenant default remedies--that might create significant concern for Western investors, and offer recommendations that avoid pitfalls.